This Turtle Brownie Cheesecake is the best of both worlds- a chewy brownie bottom topped with a creamy cheesecake layer. And if that wasn’t already delicious enough, there’s a layer of chocolate ganache on top covered with a pile of toasted pecans, caramel sauce, and hot fudge sauce. Such a delicious and decadent dessert and definitely one of my favorite cheesecakes. 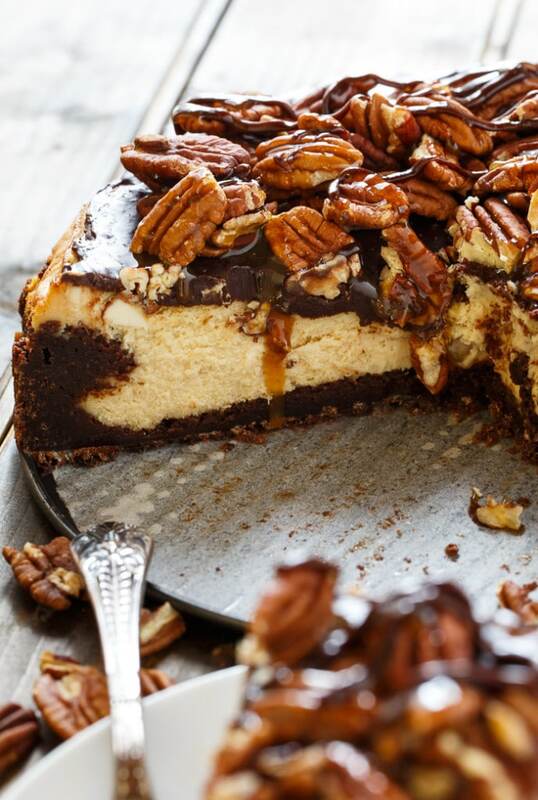 Brownies are my very favorite dessert and if you like brownies as much as I do, you will not be able to get enough of this Turtle Brownie Cheesecake. First step is making a homemade brownie batter for the crust. It is partially baked before adding the cheesecake layer. The brownie layer really expands up as it bakes, but don’t worry, it will settle back down, especially when the cheesecake layer is piled on top. It naturally sinks more in the middle, forming a crust part way up the sides. I find that baking the cheesecake for an hour and then leaving it in the oven for another hour with the oven off and the door cracked is the perfect amount of time to cook it. 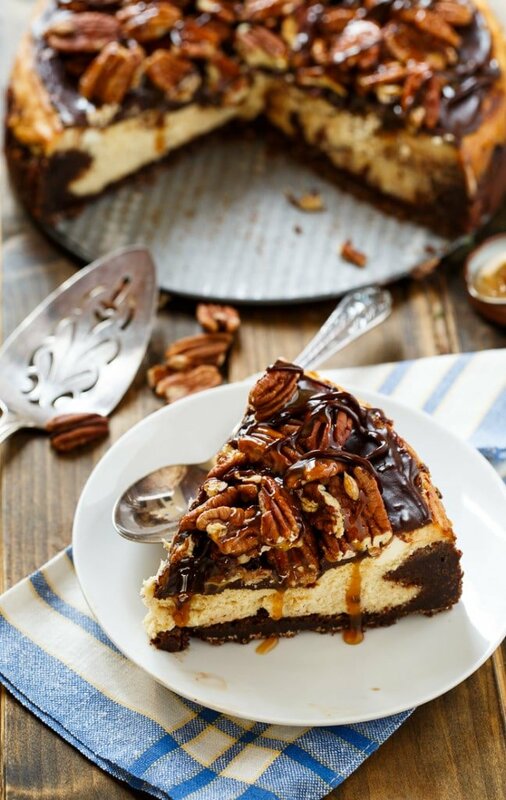 Let it cool, cover the top with a ganache and tons of pecans, caramel sauce, and hot fudge sauce and you’ll have one of the most delicious cheesecakes ever. 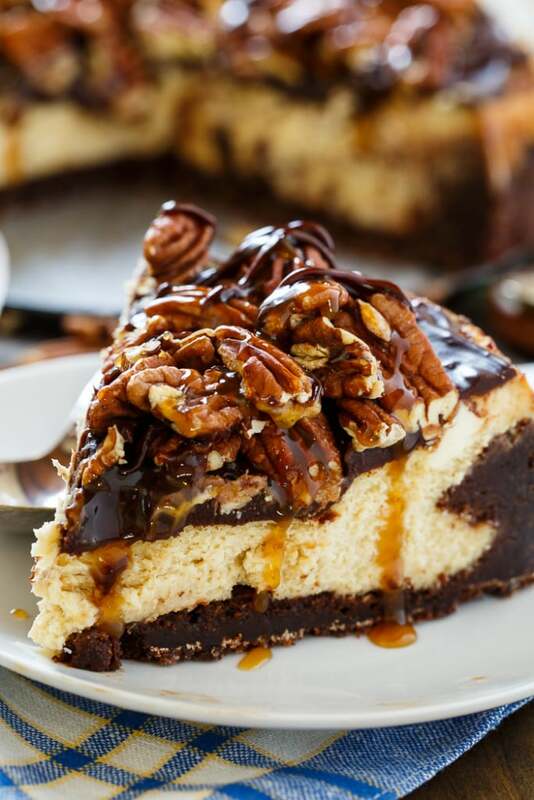 Turtle Brownie Cheesecake has a chewy brownie layer on the bottom topped with a creamy cheesecake layer and a chocolate ganache, plus toasted pecans, caramel sauce and fudge sauce. Truly decadent! Preheat oven to 325 degrees. Line the bottom of a 9-inch springform pan with parchment paper and spray pan with cooking spray. In a medium saucepan, heat butter, sugar, and water, stirring to combine. Bring to a simmer and remove from heat. Stir in vanilla and chocolate chips until chocolate is melted. Let mixture cool slightly and then whisk in the eggs one at a time. Combine flour, baking soda, and salt and stir into chocolate mixture. Pour brownie batter into prepared pan. Place on a baking sheet in case there is any leakage and bake for 20 minutes. Remove from oven and let it cool slightly before pouring cheesecake mixture on top. Do not cool too much though or it will pull away from the sides and the cheesecake mixture may seep down. To make filling, beat cream cheese until smooth and creamy. Add brown sugar and flour and beat until fluffy. Beat in eggs one at a time. Scrape down sides of bowl with a rubber spatula to make sure everything is evenly combined. Add cream and vanilla and beat just until combined. Pour cheesecake mixture on top of brownie bottom. Note: The brownie will have risen quite a bit in the oven but the cheesecake layer will help compact it down. Place back in 325 degree oven for 1 hour. Turn oven off and crack the door but leave cheesecake in oven for 1 more hour. Remove cheesecake from oven and cool to room temperature. Before serving top with pecans and drizzle with caramel and fudge sauce. This entry was posted in Cakes, Desserts and tagged cheesecake, chocolate, pecans. Bookmark the permalink. Was a fail for me. Did everything exactaly as specified. But the cheesecake was under done. Gooey. Can’t put it back into the oven, or the brownie would be a brick. Expensive ingredients wasted. Made this for a wedding shower this past weekend and WOW what a winner! While I was making it, I was concerned that the brownie layer was still quite “wobbly,” but it ended up baking up PERFECTLY with the cheesecake! I added a piped border of chocolate whipped cream (1/2c whipping cream + 2Tablespoons each of powdered sugar & cocoa powder) and it was both gorgeous and delicious — so many good comments. Thank you!! I made this cheesecake the other day according to the recipe. I did bake it in the extra pan with some water per other cheesecake recipe recommendations but that’s the only thing I did differently. It came out very undercooked in the middle. Is it supposed to be baked at 325 in a convection oven? Just trying to figure out what went wrong. The taste of the part that was fully cooked was amazing so I’d love to bake it again. I loved this recipe; however, my brownie crust ended up being really hard. I made it exactly as directed. Any tips on how I can keep this from happening next time? I place the cheese cake in another pan and poured water in the bottom. If you research cheesecake recipies this is how they bake them. I recently made a chocolate chip cookie dough cheesecake and did the same. Came out perfectly. 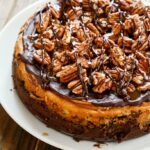 Would the brownie and cheesecake freeze well for a week and add the ganache and pecans the day of serving? I haven’t tried freezing this particular cheesecake Rondee, but ti should do alright. Wow that looks amazingly decadent! So many layers to love here 🙂 Love the idea of using a brownie crust too! If I want to impress someone, I’d make this cheesecake. It sounds and looks out of this world!! This is out of this world- goodbye resolutions, you were stupid anyways 🙂 Delicious, pinned! Ummm WOW! Easy to see why this is one of your favorite desserts! Talk about delicious decadence!! 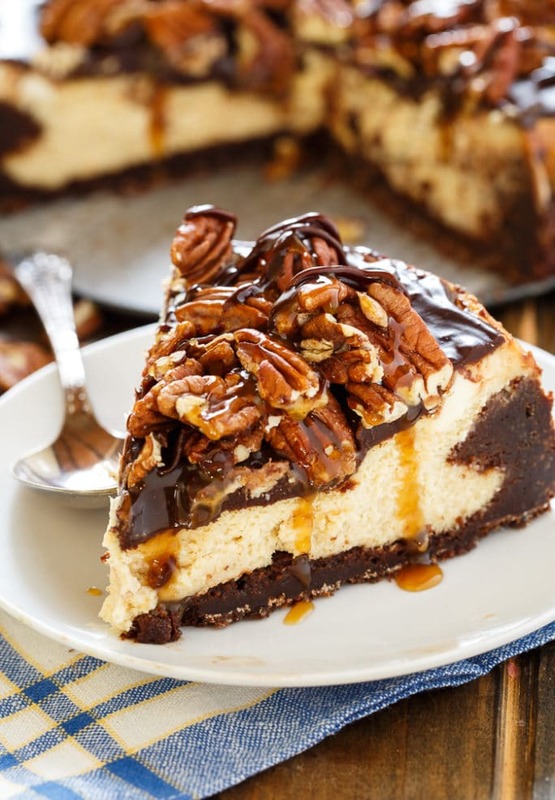 Love the brownie bottom, cheesecake top with pecans, caramel and fudge sauce. This is a smorgasbord of scrumptiousness in ONE cake! Drooling for sure! Pinned! Cheers, my dear! Wow! This cheesecake is just stunning, Christin! I love the turtle and brownie combo. What a decadent treat! OMG, Christin! This looks amazing. I’m hungry right now and I wish I had a piece of thissssss. This is totally my kind of cheesecake! I love that you used a brownie crust and that chocolate ganache sounds to die for! Here I am on my healthy food kick and you post this — I can’t take it! 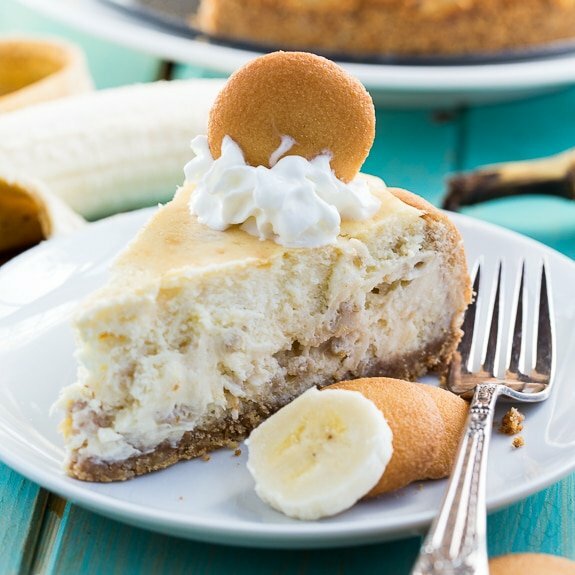 This looks so decadent and cheesecake is one of my biggest weaknesses! This looks awesome!! Sooooo decadent!! 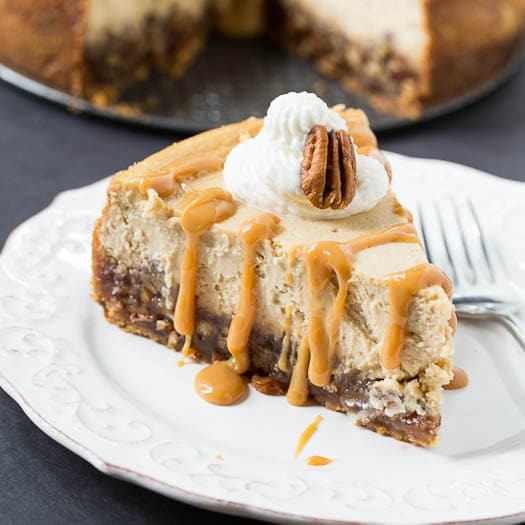 I love the combo of chocolate and caramel together, so it sounds great on cheesecake. Yum!